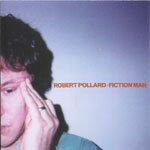 Songs written by Robert Pollard. Instruments by Todd Tobias. The majority of the lyrics and almost all the song titles are based around some of the poems from EAT, Bob's literary magazine. The Louis Armstrong of Rock and Roll is actually an ode to Pete Jamison. Release info: Material that was originally written by mr. pollard a few years ago is taken up north and mr. todd tobias does an unbelievable job of becoming a one-man band (really, these tracks swing like a group) and executing the instrumental side of the compositions. mr. pollard, dare we say natch, composes lyrical and melodious beauty throughout...kids, the next chapter has been written and now told... From RichT: These songs were songs that Bob had demoed during the Earthquake Glue demo time. These were all the leftover songs that he decided not to record. So as producer Todd had the Bob acoustic demos and he took it from there. Lyrically most of the songs were different back then.